The slow cooking of this Italian-inspired pot roast results in tender slices of beef with plenty of well-flavoured, sweet red wine gravy. Serve with mashed potato. Preheat the oven to 150°C, gas mark 2. Place the shallots in a bowl, pour boiling water over and leave for 1 minute. This will release the skins and ease peeling. Then drain and peel. Heat the oil in a large flameproof casserole on the hob. Place the beef into the hot dish and sear over a high heat for 4-5 minutes, turning the meat regularly so that the outside is a deep golden colour all over. Transfer onto a plate and set aside. Add the carrots, celery and shallots to the casserole and gently fry over a medium heat for 2-3 minutes, until just golden. To make a bouquet garni, tie the fresh herbs together with kitchen string. Stir in the tomato purée, then pour in the wine and beef stock. Add the bouquet garni and season. 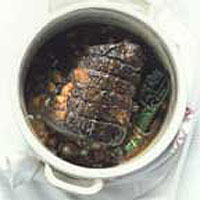 Bring to the boil.Return the beef to the casserole, cover and transfer to the oven. Cook for about 3½ hours, stirring every 30-45 minutes. To serve, allow the beef to rest for 20 minutes, then slice. Remove and discard the fresh herbs. Serve the beef with mashed potato and a spoonful of the vegetables and sauce.